Editor's Note: The majority of the information on this page is from the February 22, 2012 Elizabethton Star article "Mapes Celebrates 100th Anniversary". The Mapes Piano String Company is one of the oldest and most stable manufacturing facilities in Carter County. Mapes is a producer of high quality piano and guitar strings and began production in Elizabethton in 1950. The original Mapes Piano String building was located on Pine Street. It has since grown into a 200,000 complex that is spread out into several buildings that cover four city blocks near the downtown Elizabethton business district. The company got its start in 1912 with Stephen Mapes which was a prominent piano string manufacturer in New York City. In 1918 the company was purchased by John Adam Schaff which was the great grandfather of the current owners. During the past 100 years the company has upheld its tradition of producing a high quality product. It is a tradition that has been passed down through five generations and is being carried forward by businessman Bill Schaff along with two brothers, Frank and Bob, and three children, Mark, Regina and Stephanie. Although musical component wire can bought anywhere in the world, the Schaff family takes pride in producing an American-made product. "We get calls almost every week wanting us to outsource our operation or move it completely to somewhere like Mexico, Indonesia or some other place overseas, but we intend to stay right here in Elizabethton and employee local people. Our employees have a good work ethic, are loyal, and have an accumulative 2,000+ years of experience. "When the Mapes company began production most American pianos were being built in New York, the center of the entertainment industry. However, when George William Schaff Jr, took the helm of the Mapes company, he decided to build a better source of piano core wire that wasn't available on the market at that time. The Mapes Company was one of the first wire companies to produce piano string wire with a special heat treating process. Gold wire has become "the " standard in piano strings. Steinway , the noted world standard maker of pianos, uses piano string wire produced at Mapes. World War II had a dramatic effect on the company's production. Due to the lack of materials, Mapes piano strings for a time were wound with aluminum instead of copper. It was also during World War II at the height of the conflict that the company converted its plant to include the production of strand and splice aircraft cable. William George Schaff Jr. took over the company business in the early 1950's and decided to move the operation out of New York City. He and his uncle, Joe Miller, were driving around Northeast Tennessee looking for a possible relocation site where they could be closer to major customers. They also wanted to relocate in an area which offered the lowest electric rates in the nation. They almost chose Mountain City, but the railroad in Elizabethton was the deciding factor. The Elizabethton operation began in 1950 in a building on Pine Street. The first employee was a worker from a local roofing company, who was on top of the Pine Street building repairing the roof. Schaff gave him a job on the spot. While sourcing wire-drawing equipment from Europe and high quality rods from Sweden, Schaff began the task of training its Tennessee workforce in a largely unfamiliar discipline. The workers learned quickly and well, and by the mid-1950's, the company was producing piano strings from the nation's finest wire. The company became so well known for its strings that in 1972, the New York operation was closed and merged with the Elizabethton plant. A few years later Mapes began using the Elizabethton factory's improved production capacity to manufacture high carbon steel wire for mechanical spring makers. These spring makers are used in automotive, home construction, and musical industries. They are also used by defense industries in grenade pins, machine guns, mortars, and missile guidance systems. Mapes mechanical spring wire has even been used in space shuttles and lunar modules. Spring wire manufacturing has grown to represent over 50% of Mapes' total sales. Not only does Mapes produce piano strings and piano wire, but it is also a manufacturer of guitar strings. Its guitar string wire is sold to virtually all companies which make guitars. In the 1960's the company began producing core wire for guitar, mandolin, and banjo strings. In 1992, the company upped its guitar string ante, becoming a major player in the production of guitar wrap wire. The company produces a variety of guitar string types including round and hexagonal guitar core wire in both tin-coated and its signature "International Gold" brand as well as guitar wrap wire in varieties including nickel-plated steel, stainless steel, phosphor bronze, 80/20 brass, pure nickel, and silver plated copper. Mapes works closely with may of the manufacturers to establish unique specs and nuances not only in the makeup of their music wire, but in the way their strings are wound and produced. Making the "musical" wire is a very complex business, requiring both machinery and strong steady human hands. "Many of our employees have been doing this for years. They are very skilled at what they do." said Bill. A the maps wire mill, three furnaces are used to heat treat copper and steel rods. In some cases temperatures exceeding 1900 ⁰ Fahrenheit are required. Once tempered ,, the rods are transported to precision drawing machines where each rod may be drawn up to 30 times to achieve the prescribed dimensions and structural characteristics. The process begins with 5/8" steel and copper rods, of which the precise controlled chemical makeup is produced exclusively for Mapes. Newly produced wire is tested for ductility, tensile strength uniformity and chemical composition. One computer system tests wire at a rate of up to 4,000 samples a minute, analyzing and comparing production line stock with company and client specifications. Throughout the four generations of Schaff family string makers, Mapes has seen a great deal of change with respect to the manufacturing of strings. Through modern technology they have been able to upgrade their string winding equipment to be better and more efficient. The art of making piano strings is a craft of skilled laborers. "We have machines that will make loops and cut strings to length and do all that for us automatically and they're good, but some of it is a handcraft and we want to keep it that way. We make the loops by hand and wind the copper by hand." Bill explained. Each piano string is wound by a craftsman, usually with over 20 years of experience. "Quality" sets Mapes apart from its competitors. Everyone at Mapes is quality oriented. Apprentices are trained by veterans who have worked a the company up to 45 years. In some cases, today's apprentices are the children or even grandchildren of the veterans training them. "It is about being able to make an outstanding product. We make all of our own wire, and we control all of our processes here. Our workforce is invaluable. From the men who run the furnaces and wind the wire, there is an understanding, expertise, and passion that have been passed down through the years. As one man retires, another, often a relative or a friend, takes his place." Bill said. The company presently has over 125 employees. Mapes' century in business has resulted in the development of unique capabilities that translate into unparalleled customer service. For example, the company has the ability to warehouse client orders facilitating piano makers' just-in-time manufacturing needs. In addition, the Mapes Piano String Repair Department is one of the only facilities in the world capable of creating custom piano strings for virtually any piano made over the past 200 years. An integral part of the more recent history of Mapes has been Mrs. Jane Schaff. Until recently, Mrs. Schaff has worked first along side her husband and then her three sons, Bill, Bob, and Frank, in the business. Now 97 years old, Mrs., Schaff, impaired by a stroke, resides in a nursing home. She had remained active in the company well into her nineties. The next generation poised to continue the quality of Mapes includes Regina Schaff Harris, corporate secretary, Stephanie S Schaff, treasurer, and production manager Mark Schaff. 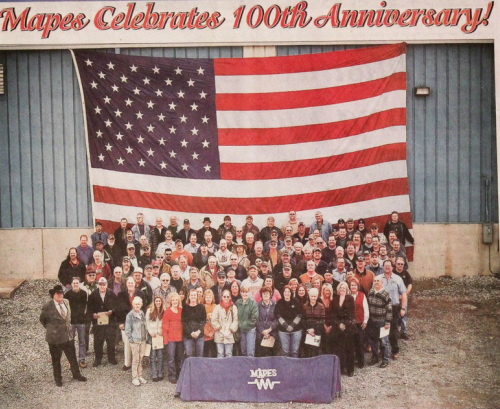 In an article in the February issue of "The Music Traders" recognizing Mapes' 100 years in business, Bill stated "The hallmark of Mapes past success as well as its prospects for the future are 100 years of knowledge and craftsmanship and love of the products made here. Wire...a never ending quest to make 'strings that ring' just a little truer and brighter every single year."